Exploring the birthplace of Rani Lakshmibai, Arjun Narayanan discovers dilapidated forts, prisons and much more. The train slowly pulled up and I pushed my head out the door to see the name of the station painted in black on the yellow background, the ubiquitous pattern of the Indian Railways. Jhansi had arrived, or rather I had arrived in Jhansi — an otherwise sleepy town, famous on the tourist map for its heroic Rani who led an army and fought the British during the Revolt of 1857. Born in Kashi (Varanasi) and originally named Manikarnika, she was married at a young age to Gangadhar Rao, the Raja of Jhansi and given the name Lakshmibai. We began our sojourn at the decrepit Lakshmibai palace. Built in the late 18th century, the palace is in partial ruins and seems to be&nbsp; shorn of every bit of its former glory — if any had ever existed, that is. Many old defaced stone-carved statues were strewn carelessly around the rooms. These are supposedly ‘preserved’ by the Archaeological Survey of India (ASI). My first experience in Jhansi was far from pleasing and did not seem worth the effort. I asked my friend to take me elsewhere. We reached the Jhansi fort, the seismic point of the Lakshmibai saga. A guide was more than willing to show us the way. We moved around as he kept belting out tales of yore one after another. “This fort was built in 1613 by Raja Bir Singh Deo, the ruler of Orcha”. This fort too, needed maintenance but it was far better than the one I had seen earlier. “Maharani (Lakshmibai) was born Manikarnika. Her father trained her in martial arts even though she was a girl,” he said as he led us through the inner portals of the fort, through buildings including the Diwan-e-aam, Diwan-e-khaas, the Rani’s private chamber and the room where she used to swing with her friends, after which he led us out to the open part of the fort. 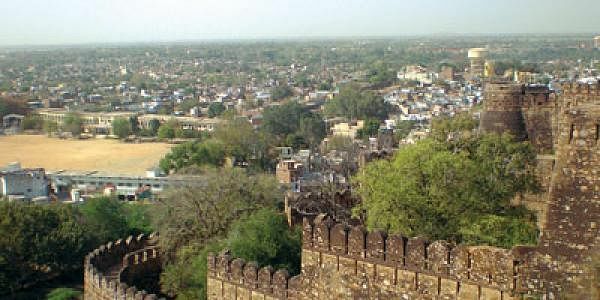 The ramparts of the fort, guarded by ten gates named after the martyrs of the Revolt of 1857, stood majestically high over the city and the settlements far ahead could be seen from that point. The 50-something guide walked ahead of us, waving a lathi carelessly in his hand, while we took our own time, taking photographs along the way. “From here the soldiers would place their bows and shoot arrows,” he said, indicating the upper portions of the wall, “and from here, they used to fire canons.” A reconstruction of the deadly battle has also been etched in stone near the fort. Continuing with his story of the queen, the guide said, “Jhansi dreaded&nbsp; the capital punishment that Maharaj Gangadhar Rao used to mete out. We have a popular saying here — Jhansi gale ki faansi, datiya gale ka haar, Lalitpur kabhun na chodiyo, jab tak milta udhaar,” he said, pointing to the gallows that stood there. According to the story the guide told us, the Rani used to go for her daily puja to the Shiv Mandhir. Since the gallows were on the way there, she would hear the cries of the prisoners being hanged to death. This greatly disturbed the Rani and she requested the Maharaj to do something about it. The Maharaj, who loved her dearly, did away with the death sentence altogether. “Then Rani became even more popular with the masses,” our guide said, leading us to the Shiv Mandir downstairs. The temple is still a hive of activity with its rituals, and sees a huge crowd during the Mahashivratri. As we moved on, the guide suddenly stopped and knelt down. He seemed to examine something on the floor. “Come here sirji,” he called. The spot he was examining looked like a man-hole. “This is the dungeon. The prisoner would be thrown into this kaal-kothri and he would fall into the basement where no light would reach. It was a dreadful prison!” Holding onto my mobile phone, I peered into the murky depths of the ancient prison. The guide went on with the story and ended by saying, “The Rani fought for the city and attained martyrdom in Gwalior. After the Revolt, nothing was left. All the Baniyas of Lalitpur left the place and the city was consigned to anonymity.” It was not hard to understand that the guide felt a sense of allegiance towards the town’s long-dead queen, just like many others in the town. Dusk had crept in by this time and it was time for the ‘Sound and Light’ show. We seated ourselves in the space marked for spectators. As the sky grew dimmer with the sun almost gone, lights were turned on and out of nowhere, I could hear horses speeding nearby. The gala show had started. announced in a&nbsp; familiar baritone. I realised that Om Puri’s voice, playing the role of the Jhansi Fort, was the sootradhar of this show. The story of Lakshmibai began. “I saw my queen enter the fort resplendent in her wedding attire...” went on the narrative. Then came the twist in the story. The king was dead and since there was no biological heir, the East India Company’s agent came to the Rani to impose the ‘Doctrine of Lapse’ on Jhansi. “Main apni Jhansi nahi doongi!” This climatic line, delivered strongly by Sushmita Sen, who played Lakshmibai, echoed across the fort, setting the tone for the rest of the drama. I soon realised, both from my conversations with the guide and from the show, that Lakshmibai was no less than a demi-goddess in Jhansi. People looked up to her and to date, continue to respect her memory with all the deference that is bestowed on a queen. The show ended but I discerned that in her death, Rani Lakshmibai had become a heroine larger than in life. Subhadra Kumari Chauhan had enshrined the Rani in popular imagination through one of her poems, which is repeated at every turn in Jhansi and is at the tip of every tongue in this town. ‘Bundele harbolon ke muh humne suni kahaani thi, khoob ladi mardani woh toh Jhansi wali Rani thi...’ (From the bards of Bundelkhand have we heard her saga, the queen of Jhansi who led a tough fight with the spirit of a man). After all, it was no mean feat for a woman of 23 to lead an army into fighting the mightiest empire in the world.